Play a plucky band of agents in colourful Seoul. 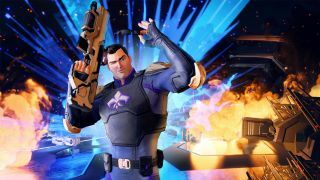 Agents of Mayhem is set in the Saints Row universe, but it’s not a Saints Row game. It sure feels like one, though: the wacky and upbeat sense of humour from the recent games is here, along with the exaggerated characters and garish colour palette. So what makes this different? Well, you can switch between three heroes at any time in-game, each of whom have their own abilities and weapons, and these can be selected from a larger roster of 12 agents. The name suggests something entirely new, but like Saints Row, this is an open-world game with a knockabout, affable tone. The diverse selection of heroes makes a strong first impression, even if there’s a sense that leaving out co-op seems like a bit of a missed opportunity. After two games set in the same location, it’s nice to see Volition take us somewhere new, in this case an extremely colourful rendition of Seoul. There’s a noticeable glow to the visuals that Saints Row games didn’t have—this clearly benefits from not being tied to last generation consoles like Saints Row IV was. While I didn’t get much of a look at the open world—the demo was a mostly linear runthrough of one level with only a snapshot of exterior environments—the change to a brighter, more near-futuristic-looking locale is pretty refreshing. I notice I can’t enter any vehicles dotted around the map, unlike in Saints Row, but I’m assured that’s just not in the game yet. Clearly this is just an early build. “Vehicles are absolutely part of the game, we just don’t have them in this first demo,” Shekar says. “But Mayhem will have their own vehicles that the agents will be able to call at will. You can pick from a suite of them, [and] you’ll unlock them as you play the game. But then also you can jump into any pedestrian vehicle and take control of them, but in the end you’re probably not gonna want to do that too often because the agent vehicles are so easily accessible and much more effective.” Those fond of the radio stations in Saints Row may be disappointed to discover there’s no licensed music in this one. To compensate for the lack of Saints Row’s appealing character creator, the roster is an eclectic one, with each hero having very different loadouts. Four agents have been revealed so far out of twelve. You’ve got brainless actor Hollywood, whose special ability triggers loads of random explosions in your vicinity, the shotgun-wielding Hardtack who pulls enemies towards him with a harpoon, and the bow-wielding Rama, as well as a fourth I didn’t use, the drone-wielding Fortune. Each character’s weapon feels convincingly different, and their special abilities are all unique, which encourages you to experiment in who you take into missions. Some players will miss the option, I suspect. But otherwise I’m pretty fond of Agents of Mayhem’s direction, and I look forward to trying out more superheroes—their individual movesets feel well thought out and satisfyingly different from each other. With the same humour as Saints Row, as well as a vibrant new locale to explore, this is pretty much the series’ spiritual successor.